It is a well known fact that Project manager‘s spend their time on communicating with stakeholders. On an average 90% of the time are spent on communication. For success of any project a lot depends on how information is distributed among right stakeholders on time and necessary change requests are initiated before the situation goes out of hand. In PMBOK 4 , listing and managing stakeholders were part of Communication knowledge area. Since the dynamic nature of stakeholders presence needed a greater emphasis on how to manage stakeholders in an effective way. This may be the reason why PMI though of including “Stakeholders” as an individual knowledge area. It is very important for a PM to identify the right stakeholders for right information at right time through out the life of a project and distribute information accordingly. There is no point to give information to stakeholder no longer impacting the success of the projectand missing the important stakeholder who was not so active during the planning phase but becomes active in execution phase. 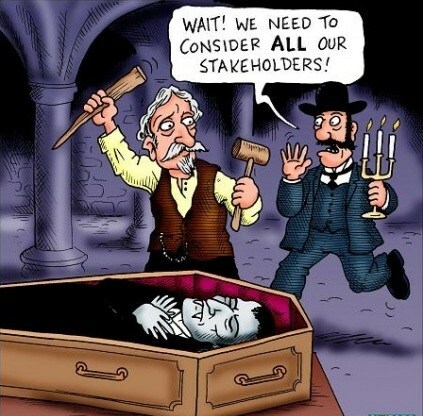 Inability to identify the stakeholders can result in failure of project or not meeting the deadline. The importance of this process resulted in addition of a new Knowledge area called “Stakeholders”. It is needless to say as most of the processes these processes are also iterative and PMs should re-asses the validity of stakeholder lists on regular basis.